Just published! Please check out this month’s column by “The Mirror” on AikiWeb. It was my turn to write, and I’d been struck by the similarity between a recent meeting with my teacher, Dave Goldberg Sensei, and the half halts we use to bring horses back to a centered, responsive place. If you ever want to make a year fly by, here’s how to do it. First, anticipate that you will likely be testing for shodan at some point this year. Next, sign up for a study course to be certified as a Group Fitness Instructor (GFI). Plan to be done with it by summer. Ready to rock in your new career. Along with your writing you can help people be healthier and happier. Buy a notebook, highlighters, and pens. Put everything in a big tote bag so you can study anywhere, even at the park. Dive into the material. For a week. Now, decide that this is the right time to remodel the house. Drop writing studying like hot potatoes for 6 months and instead focus on choosing flooring, rearranging furniture, and picking paint colors. 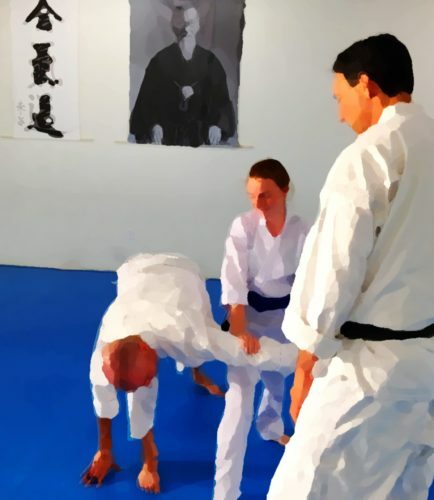 Meet with Sensei, along with a friend who will also be testing, and schedule your shodan exam for December 13th. Many months away. Plenty of time to train and prepare. Refinish the kitchen cabinets. Landscape the driveway entrance. Collaborate with the contractor. Throw a big party when it’s all done. Check the calendar and note that if you don’t schedule your pre-paid GFI certification exam in the next 2 days you will have to pay again to schedule it later. Schedule the certification exam for Friday, October 24th – as far out as you dare without being too close to your ranking exam. Dive into the material again. Discover that you don’t know anything that’s going to be on your shodan exam. You’ve seen and done it all before, of course, but it escapes you now. Kazushi is kaput. Ma’ai is MIA. Even your gi are all goners. Start training on Sunday afternoons with your testing partner, friends, and sempai. Take all your gi to a tailor. Train, train, train. Make progress, slowly. Get back to working on your books. Realize there is more to do on the house. A lot more. Only the contractor’s part is done. Try to divide your time 50/50 between studying-writing and house projects. Study and write Sundays-Wednesdays, work on the house Thursdays, Fridays, and Saturdays. Try to settle into a routine. See that your elderly, arthritic donkey friend is getting worse week by week. Try everything you can to help. When that finally doesn’t work, let him go. After a few days adrift your brain starts churning out ideas again. Branding concepts, business models, marketing messaging… Blog posts resume writing themselves. Jot down ideas everywhere. Wake up inspired to write. Forget to drink coffee one morning! Today will be about putting away all the stuff in the bedroom that’s still out after construction. And then there’s making a salad for the big dojo summer party after tomorrow’s kyu exams. How is July almost over already?